Many areas of the country are experiencing a high number of homes on the market and in some areas inventories of homes on the market are at all-time highs. In some price ranges around the country there are as much as a 6 month to a year or more supply of homes. As a veteran Realtor I strongly feel that any home can sell in any market if certain factors are in place. You cannot change your location or the floor plan of your home but you have another option. I agree you can detail your own car because it is a basic case of cleaning the interior well and polishing the exterior. Just about anyone can detail their own car and nearly everyone details their car if they are selling it on their own. Your home is an entirely different matter. You see you “Live in your home a certain way that fits your personality“. Every home has the personality of the owner and it tells a story about you and who you are. When you sell your home however you need to “Appeal to the Masses“. By this I mean you need to appeal to the senses of every stranger that walks through your home when you are offering it to the public. Your Realtor is a professional and if he or she does their job correctly they will show you market data and absorption rates that will show you where your home needs to be priced to sell. What they cannot do is “Stage” your home to appeal to the masses. Why is “Staging” important you ask? Think about it. Why do you only shop at certain department stores, grocery stores, restaurants, etc? Yes, prices are important but my guess is that you repeat shop at certain public places because you like the environment and how you “Feel” when you are there. Large department stores spend millions of dollars attracting the public to their store. You have to do the same with your home on a smaller scale. Professional Stagers are trained to create the same “Feel” you feel when you are in your favorite department store. There are certain colors, lights, and furniture arrangements that will “appeal to the masses” and give your home an advantage when it is being shown. Professional Stagers know what these are and how they need to be arranged. Think about it. If you fall into one of the market areas USA and have 20,30 or more homes in your price range that you are competing with, what is going to set your home apart when it comes time to offer it “For Sale”? Any Realtor can put a sign on your front yard, place a lock box, do color fliers and do print and web advertising etc. All the advertising known to man will not help if no buyers want to see your home or if they go in your home and don’t “Feel” what they need to feel to become interested enough to make an offer on your home. Recently a builder called me and asked if I would consider being a co-listing agent for one of his new homes that had been on the market for over 100 days. I usually don’t do co-listings for various good reasons but I decided to help this builder and his Realtor out this time. I agreed on one condition. On the condition that he have his home “Staged“. I made this a condition because his home felt “Cold” and it was hard for anyone to feel this home could be their “Home“. The builder agreed and hired my home stager Maria Lechner. 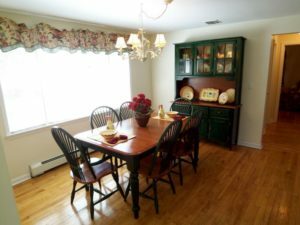 The home was staged and I co-listed the home. Within 2 weeks after staging the home we received an acceptable offer and closed the sale 3 weeks later. The builder is elated and has become a firm believer in staging. Existing homes need even more help because of the reasons I have given. We live in our homes a certain way and we need to “appeal to the masses” when we decide to market to the “Masses“. In many cases the “wrong” furniture in a home arranged incorrectly is worse than if the home were vacant. Many sellers get upset when they list their home and it doesn’t sell after several months and not even one offer is received. Most sellers immediately blame their Realtor, fire them and hire another and another and yet another Realtor. Instead of using band aids to cure your problem try this. When you call a Realtor to list your home make sure and ask him or her if they work with a “Professional Home Stager If they don’t, encourage them to find one or find another Realtor. When you find a Realtor/Home Stager team, ask if the stager can come to the listing appointment with your Realtor. You will get a running start on selling your home and have a tremendous advantage over the competition. Lets face it. Your home is a much larger investment than your car. Give it the same attention you would give your car when you make the decision to market it. When you go to the doctors you deal with a team, receptionist, nurses, doctor, etc. I believe the time is near when home sellers will not only ask a Realtor if they have a home stager on their team but will expect it.